Many Muslims are urging ISIS to take its fight to Israel instead of attacking Arabs in Iraq and Syria. A thrust at Israel would promote ISIS’s popularity in the Arab world and would boost its funding efforts among certain Arab leaders. What is worrying to Israel, is that ISIS is seeking to expand into southern Syria and the Syrian capital of Damascus. 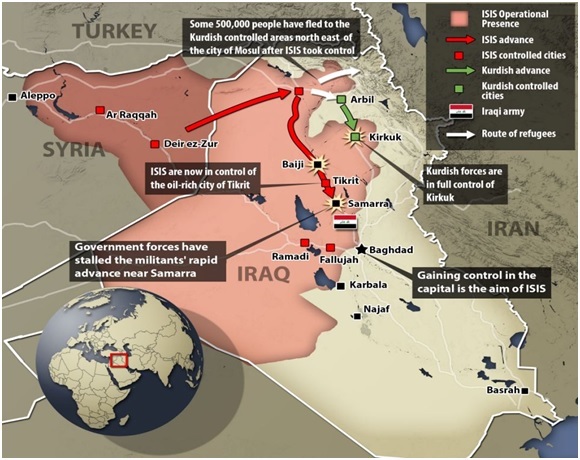 ISIS has convinced three Syrian rebel groups operating in the south of Syria to join ISIS. Israel is more concerned these days about ISIS as ISIS makes gains in Syria. It is clear to all in the Middle East that ISIS is now the “Strong Horse” in Iraq and Syria, and increasingly Sunni tribes are yielding to ISIS’ leadership. According to Hussain (KUWATI JOURNALIST), the calculus was simple. Tribes look for the “strong horse,” and in both Iraq and in Syria, that was al-Baghdadi and ISIS. “The myth is that there are radical Sunni tribes and moderate Sunni tribes. The tribes are not moderate or radical. Tribes hedge and look for the strongest power,” he says. At the time, he notes, the U.S. derided opposition groups fighting Assad in Syria as “carpenters, teachers and dentists” and hesitated to arm them. Washington was not in the game, so the decision became easy. The ISIS problem is here to stay for some time—the reality the leaders of the world do not recognize, including the Obama administration, is that nations and their rulers are often influenced by “evil spirits”—no doubt evil spirits are influencing ISIS and the Assad government in Syria. Do not forget what is stated in Ephesians (there is an international application to this verse as well), We are engaged in a struggle “against principalities…powers…rulers of the darkness of this age…spiritual hosts of wickedness in heavenly places” (Ephesians 6:12). These spiritual battles rage daily in the international arena. Western leaders like President Obama may hope that Islamic terror will eventually fade, but recent events show the naïveté of such thinking. Evil of this nature can only be defeated by greater force. The rumor is–America and Saudi Arabia are actually working together to bring down the price of oil–the reason– to hurt Vladimir Putin. The Saudis gain more market share when the price of oil goes lower (which is true), and America benefits as Russia’s economy takes a heavy hit due to reduced oil revenue (a case of geopolitical weakness on the part of Russia). But the above is actually a distorted view, the truth is– America and the Saudis are not collaborating on the price of oil—they are actually competing against each other, a three-way oil war is going on between Saudi Arabia, the United States and Russia. All these nations are competing against one another. Russia leads the world in oil production, followed closely by Saudi Arabia and just ahead of the United States. Energy pundits say there is little doubt that OPEC is looking to drive new producers with higher costs — in particular North American shale companies — out of the market. Technological breakthroughs have unlocked shale resources in the United States and raised daily US oil output by more than 40 percent since 2006, but at a production cost which can be three times that of extracting Saudi oil. The American shale revolution created an America that went from being a big consumer of Saudi oil to becoming a major exporter of Natural gas liquids and condensates, and we are importing far less oil from Saudi Arabia, and other OPEC nations. Our newfound ability to export oil and natural gas liquids hurts Russia, Saudi Arabia and OPEC. This has created tension between the Saudis and America. Both Saudi Arabia and Russia need revenue from the sale of oil and natural gas. It seems they have no intention of curbing production. This means there is plenty of oil available on the world oil markets—this oversupply is driving down the price of oil, and the price of gasoline at the gas station. How low will the price of oil go—hard to tell. 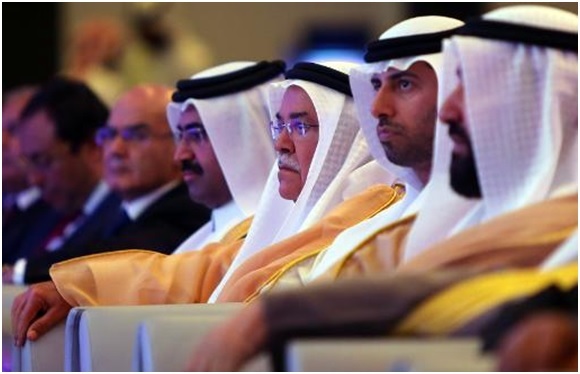 And now this just in…Saudi Arabia said on Sunday it would not cut output to prop up oil markets even if non-OPEC nations did so, in one of the toughest signals yet that the world’s top petroleum exporter plans to ride out the market’s biggest slump in years—Reuters. Where does Russia stand in this oil fight? Russia’s currency, the ruble, has fallen by over 30% in 2014. As bad as that is, it makes Russian oil and natural gas even more attractive to European and Chinese buyers. Russia will not cut production and will continue to increase its market share in Asia. Just take a look at the monster energy deal between Russia and China that was reported during the November APEC [Asia Pacific Economic Conference]. Like Saudi Arabia, Russia needs the money. We may see lower oil prices for some months. Wars and rumors of wars [see Matthew 24:6], but in a way you may not initially appreciate, make no mistake about it—this is a war, but not a war using tanks and troops but an energy war. Russia and Saudi Arabia are in an energy war with each other over market share, and both are competing with US shale. Throw in rising political tensions—the US wishing to do economic damage to Russia, Russia determined to stand its ground on Ukraine, the Saudis angry over US foreign policy in the Middle East, mostly because America’s newfound softness toward Iran—and you have a mass of shocking cross-currents. Another factor impacting markets… Weak demand in China — where the economy is slowing after decades of spectacular growth — is likely to continue, said Bassam Fattouh, director of the independent Oxford Institute for Energy Studies. Competition for Asian markets has meanwhile grown, he said, after the production increase in the United States allowed it to reduce or stop crude imports from the Middle East, West Africa and Latin America. “That has created a shift in oil trade flows,” he said. Oversupply, lower demand and the stronger US dollar have all contributed to pushing down oil prices, which have dropped 50 percent since June to around $60 a barrel. The world economy promises more surprises in 2015! Jesus Christ describes this abomination of desolation in Matthew 24:15-20. Beginning in verse 15 we read: “Therefore when you see the ‘abomination of desolation’ [a vile image], spoken of by Daniel the prophet, standing in the holy place… then let those who are in Judea [today known as the modern state of Israel] flee to the mountains.” The people in Judea are instructed, when they see this terrible abomination of desolation, to flee to the mountains. Also, Luke 21:20 states, “But when you see Jerusalem surrounded by armies, then know that its desolation is near”. Christ’s stern warning about an “abomination of desolation” means, literally, “the abomination of the desolater”. An “abomination” is something God hates, and comes from the Hebrew word shakaz, for an idol–something, or someone who is worshiped in place of the true God. Prophecy is clear– Jerusalem is again to be surrounded by armies (Zechariah 12:2) and an idol– some type of image, will be set up in a holy place. Notice Jesus Christ urges those who are in Judea to quickly flee when this desecration takes place. “Let him who is on the housetop not come down to take anything out of his house. And let him who is in the field not go back to get his clothes” (Matthew 24:17-18). So dire is Christ’s warning, that if you linger and wait, it will be too late to escape destruction. Christ also warns–“But woe to those who are pregnant and to those with nursing babies in those days! And pray that your flight may not be in winter or on the Sabbath [God’s people will be keeping the Sabbath]” (verses 19–20). The key to understanding this warning is to understand what Daniel wrote in his prophetic book. The mention of the abomination of desolation is taken from the book of Daniel. They shall defile the sanctuary fortress; then they shall take away the daily sacrifices, and place there the abomination of desolation (Daniel 11:31). This describes a complete desecration of the temple, prefigured by Antiochus Epiphanies. Now we take a look at the model, template or blueprint of history to see more clearly this future end-time event regarding the “Abomination”. Some 160 years before the First Coming of Christ (168/167 BC), a Greek, Syrian king named Antiochus Epiphanes came to power he did great harm to the Jewish nation—all Jews of Christ day knew about this man— as far as the Jews were concerned he was the Hitler of that era. Antiochus Epiphanes was a despicable, cruel king of the Northern Seleucid (Syiran) dynasty (Daniel 8:9-14). He came to the throne when his brother Seleucus was murdered and a son of the dead king (Demetrius 1 Soter) who might succeed him, was held hostage in Rome, Antiochus took advantage of the leadership vacuum, to take control of Syria. Soon afterwards, Antiochus developed an alliance with an Egyptian ruler named Ptolemy VI Philometer. Using this alliance (feigning friendship), he then moved to gain greater power in Egypt. Using deceit and subterfuge, Antiochus then made a play to take over Egypt—with a small force of people (Daniel 11:23), he conquered much of Egypt, including Memphis all the way down to Alexandria. It was during this time period that the Jews began to rebel under the rule of Antiochus. Antiochus controlled the Holy Land and was determined to force the Jews to obey his laws. “The king also sent edicts by messenger to Jerusalem and the towns of Judah, directing them to adopt customs foreign to the country, banning burnt offerings, sacrifices and libations from the sanctuary, profaning Sabbaths and feasts, defiling the sanctuary and everything holy, building altars, shrines and temples for idols, … so that they should forget the Law and revoke all observance of it. Anyone not obeying the king’s command was to be put to death” (1 Maccabees 1:41, 44-50, New Jerusalem Bible). Punishment was swift and vicious. Women who had had their sons circumcised were killed and their babies hung around their necks (verses 60-61). Anyone continuing in faithful obedience to God’s law was executed (verses 62-64). Antiochus then set-up a bearded image of the pagan deity [Zeus] upon the Temple altar. Greek soldiers and their lovers performed licentious heathen rites in the very Temple courts. Swine were sacrificed on the altar. Josephus also explains how Antiochus profaned the altar. “Now Antiochus was not satisfied either with his unexpected taking the city, or with its pillage, or with the great slaughter he had made there… he compelled the Jews to dissolve the laws of their country, and to keep their infants uncircumcised, and to sacrifice swine’s flesh upon the altar” (Wars of the Jews, Book I, Chapter 1, Sections 1–2). Antiochus further profaned the temple. He erected a statue of Zeus in the temple and directed everyone to worship it. In the near future sacrifices will again be instituted before Christ’s return, (Daniel 12:9-13) describes the abomination of desolation as occurring at “the time of the end.” Once again sacrifices will be initiated at Jerusalem; armies again will surround Jerusalem, and the sacrifices will be cut off—this time for 1,290 days. A powerful leader will play a pivotal role in end-time events. He will be against God’s laws and will persecute those who keep the Commandments of God. Antiochus Epiphanes, who engineered the original abomination of desolation, is the forerunner of this end-time Dictator. 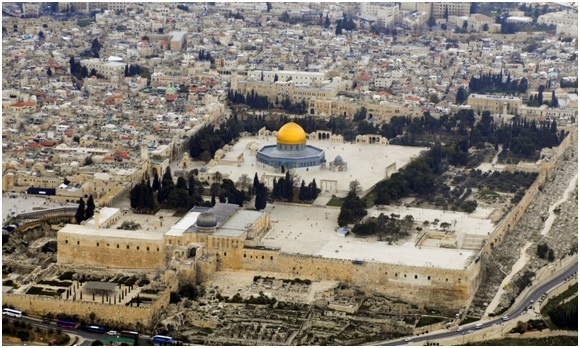 “And from the time that the daily sacrifice is taken away, and the abomination of desolation is set up…” (Daniel 12:11); clearly there will be daily sacrifices once again being performed on the Temple Mount! • Leaders in Israel moves to reintroduce daily sacrifices. • The rise of a European Dictator who will move troops into the Middle East (Daniel 11:40-44). • Geopolitical events that will lead to armies amassing around Israel and Jerusalem (Zechariah 12:2; Luke 21:20). 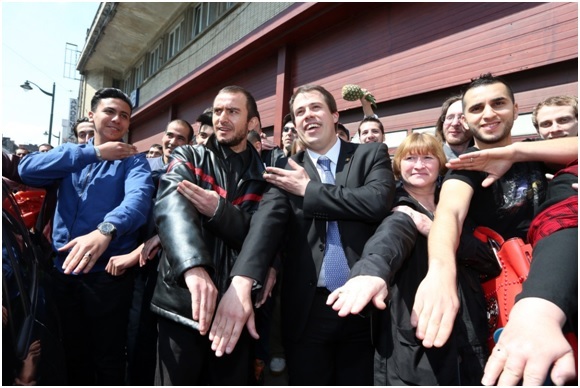 The leader of “Debout Les Belges!,” far-right lawmaker Laurent Louis (C) perform the ‘quenelle’ gesture ahead of the anti-Semitic congress, “First European Conference of Dissidence”, organised by Chamber member Laurent Louis in Anderlecht, outside Brussels. I continually monitor European response to Jews living in various European cities, and what I am seeing is not good. Hatred of Jews is on the rise in Europe. Seventy years after the Holocaust, Jews no longer feel safe. Anti-Semitism in Western Europe is “the worst since World War II”, according to the international Jewish Agency. After the fight in Gaza—this past summer, anti-Semites across Europe started attacking the continent’s Jews under the pretext of protesting Israel’s politics. The Gaza war is over but the attacks continue. The hard truth is life is not going to get better for Jews living in Europe. High unemployment, the result of economic recession, and the continued arrival of hundreds and thousands of Muslim immigrants from Africa and the Middle East can only mean the continued persecution of shrinking Jewish communities in France, Belgium the Netherlands and Sweden. 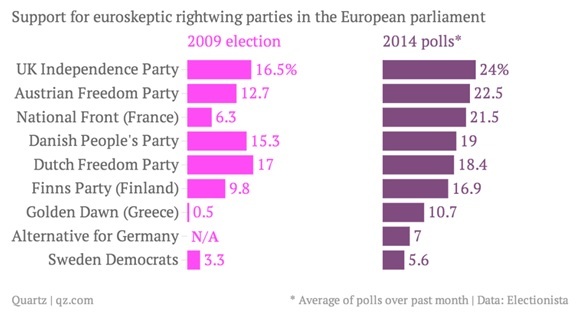 The rise of anti-Semitism in Europe, along with the success of European fascist parties (France’s National Front, Greece’s neo-fascist Golden Dawn party, Hungary’s Jobbik Party, among others) in the recent European parliamentary elections, has provoked European Jews to leave the continent –where Six Million European Jews were murdered during WWII. •Malmo, Sweden’s third-largest city, is one of the most unsettling places in Europe for Jews. Anti-Semitic attacks have tripled. •In recent months eight synagogues in France have been attacked. •This summer, chants of “Heil Hitler” and “Oh Jew, you will die” could be heard from an Algerian crowd in London. •Anti-Semitic attacks nearly doubled in France in the first seven months of 2014. France’s Jewish population is the third largest in the world after Israel and the United States. Across Europe Jewish communities are investing in security infrastructure and boosting protection. Jewish hatred will gain momentum, cresting as Christ returns to bring the nations of the world, including the Jewish people, to repentance. Regarding Jesus Christ and the Jews at the very end time, Zechariah says of the people of Judah, “Yes, they will mourn for Him as one mourns for his only son, and grieve for Him as one grieves for a firstborn.” They will finally realize what God meant through David in prophesying, “They pierced My hands and My feet” (Psalm 22:16)—that is, the nailing of the Messiah to the cross as part of His atoning suffering and death. They will at last recognize that Jesus Christ was indeed the true Messiah—that the very One they worshipped as God was made flesh and that His flesh was pierced with scourge, thorns, nails and spear for the sake of their sins and those of all humanity. Zechariah 12:10: “Then I will pour out a spirit of grace and prayer on the house of David and the residents of Jerusalem, and they will look at Me whom they pierced. They will mourn for Him as one mourns for an only child and weep bitterly for Him as one weeps for a firstborn”.